The Huxley Speaker Series will host a lecture by cultural geographer, performer, and author Carolyn Finney at 4:30 p.m. on Thursday, Dec. 6 in Arntzen Hall 100, when she will present "Ten Thousand Recollections: Black Faces, White Spaces & the Possibility of US." Finney’s book "Black Faces, White Spaces: Reimagining the Relationship of African Americans to the Great Outdoors" examines the representation, participation, and history of African Americans in U.S. parks and public lands. Her work asks us to reconsider public lands as racialized spaces and to explore the implications of this for the environmental movement. Further, she aims to “develop greater cultural competency within environmental organizations and institutions, challenge media outlets on their representation of difference, and increase awareness of how privilege shapes who gets to speak to environmental issues and determine policy and action”. She has served on the U.S. National Parks Advisory Board and was part of The Next 100 Coalition, a group aimed at improving diversity and inclusion in public lands and management. She recently left academia to pursue a full-time career of writing, speaking and consulting. Upon publication in 2014, "Black Faces, White Spaces" encouraged nationwide conversations about the racialization of public lands. “Why are African Americans so underrepresented when it comes to interest in nature, outdoor recreation, and environmentalism? 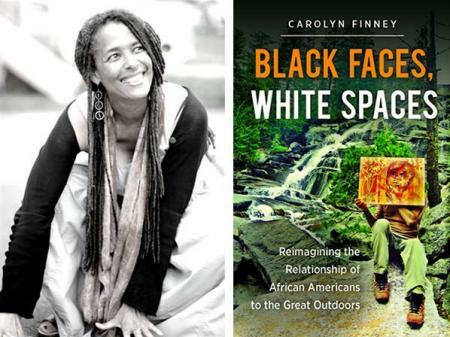 In this thought-provoking study, Carolyn Finney looks beyond the discourse of the environmental justice movement to examine how the natural environment has been understood, commodified, and represented by both white and black Americans. Bridging the fields of environmental history, cultural studies, critical race studies, and geography, Finney argues that the legacies of slavery, Jim Crow, and racial violence have shaped cultural understandings of the "great outdoors" and determined who should and can have access to natural spaces. Carolyn Finney is a writer, performer and cultural geographer. As a professor in Geography at the University of Kentucky, she became interested in issues related to identity, difference, creativity, and resilience. In particular, how issues of difference impacts participation in decision-making processes designed to address environmental issues. More broadly she likes to trouble our theoretical and methodological edges that shape knowledge production and determine whose knowledge counts. Finney is grounded in both artistic and intellectual ways of knowing - she pursed an acting career for 11 years, but a backpacking trip around the world and living in Nepal changed the course of her life. Motivated by these experiences, she returned to school after a 15-year absence to complete a bachelor's degree, master's degree, and doctorate. Finney is an alumna of WWU's Fairhaven College of Interdisciplinary Studies.